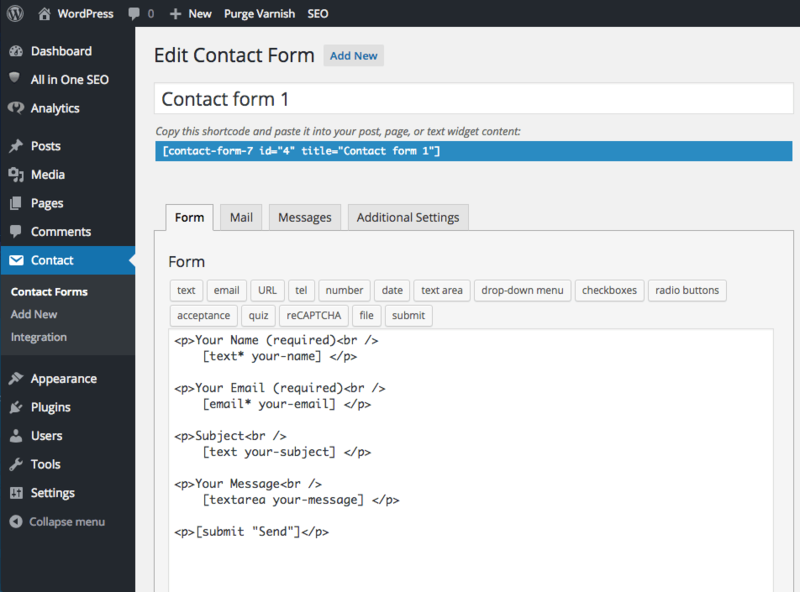 Contact Form 7 is a useful plugin that allows you to create and manage contact forms for your website. On most themes it is preinstalled. Contact Form 7 is flexible and easy to use. It allows you to create and manage numerous contact forms for your website. The forms as well as their mail content can be customized with simple markup. Contact Form 7 also supports Ajax-powered submitting, CAPTCHA and Akismet spam filtering. You can see all your contact forms by logging into WordPress and opening Contact > Contact Forms. To insert the contact form in your page, post or text widget, you can copy and paste this shortcode. Contact forms created with this plugin are fully customizable to fit your needs. In order to edit your contact form, open the Contact Forms settings page shown above and click Edit under the appropriate contact form. The settings are divided into four tabs: Form, Mail, Messages and Additional Settings. You can set up the structure of your form in the Form tab. The Mail tab lets you create a template for the messages sent through your contact forms. You can specify the to and from email addresses, the subject and additional headers. Also you can shape the appearance of the message body. The alerts displayed on your contact form can be customized in the Messages tab. Any additional settings can be specified in the Additional Settings tab. For detailed information on how to fill these tabs, you can visit the documentation and FAQ sections on contactform7.com.